It's finally Friday!! That's what I sing when I go over to my daughter's house to get the kids off to school in the morning on Fridays. They love it. Today's breakfast treat was hot Cinnamon rolls with icing, they loved that even more! Heidi called me last night and asked me to make a card for someone she works with that lost her husband on Wednesday. Sympathy cards are always difficult to make, but I have made several designs over the years that I liked so I kept a sketch of them so that when pressed, I have those to go by. The flower stamp is a Penny Black. There are beautiful words inside that say, The tide recedes but leaves behind bright sea shells on the sand, The sun goes down, but gentle warmth still lingers on the land, The music stops, and yet it echoes on in sweet refrains..., For every joy that passes, something beautiful remains. 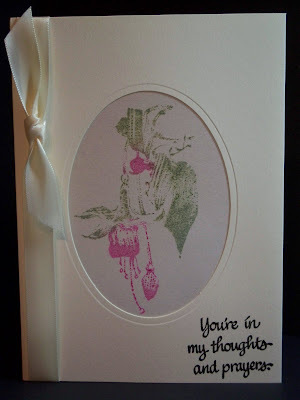 This stamp is by Inky Antics. We think of them today as they gather as a family to honor the memory of their loved one. Until later.